Week 8 of the Bloggers Challenge is here, and with it a new challenge. This weeks challenge was inspiration. What inspires you to stamp? Inspiration can come from many different sources, the inspiration for today's bloggers challenge comes from a t-shirt I own. To recreate the tye-dye look of the fabric I used the Polished Stone Technique. 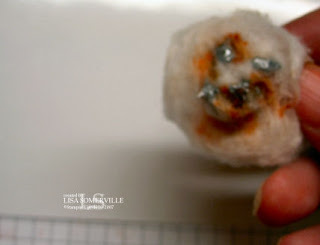 Place a few drops of the dye reinker and the metallic reinker onto your cotton ball. 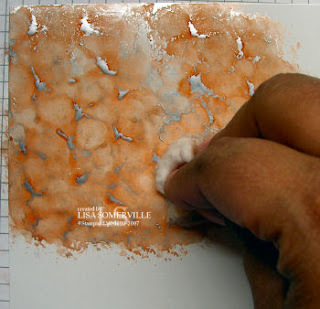 Next, add some rubbing alcohol to the area of the cotton ball where you added the inks. (Be careful not to over saturate the cotton ball). 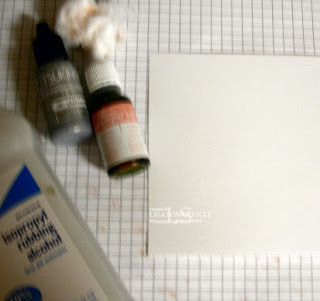 Now pounce your cotton ball onto your glossy card stock, completely cover your card stock. When finished seal with Krylon Fixative. Stamp images as desired and finish you card. Shelly wanted to know "Can I ask what re-inker colors you used?" Sure, I used Groovy Guava and Encore Silver Metallic. I know most of the time you see polished stone with 2 colors of complimentary inks - but I only wanted to use 1 - as I was after the look of the color in my shirt. To add dimension to the polished stone. I let my first application dry, and then added a second coat. Delivers a workable finish and lasting protection for artwork. Inspiration in such a fun thing, I can see a rock and be inspired for a card, its too much fun! Haven't done this technique before but you make it look EASY! Thanks for this Lisa. Your card is beautiful!! Beautiful card Lisa! It matches your shirt perfectly. I've never used a fixative with polished stone before. I'll have to try that out. It always takes forever for the metallic ink to dry. this is an absolutely stunning card! Thanks for sharing the card and the technique! I'm going to have to give this a shot. One question - what is Krylon? a sealant? Great tutorial! You did a great job with the background looking a lot like your shirt! Lisa, your card is beautiful! I love Polished Stone. Fabulous, Lisa! I just love this technique...it's one of my favorites, so easy, but such a big WOW factor. Your card ROCKS! It looks awesome with that stamp set! Your inspiration and your card are fabulous. I haven't done polished stone in a long time. It really goes so well with fall. Glad to see the technique done again. I need the remnder. Thanks for the tutorial. That is really cool, Lisa! Lisa, this is beautiful! Thanks for including step by step directions. The colors match your shirt perfect! Awesome card!!! This card is lovely. Thank you for sharing the technique too. 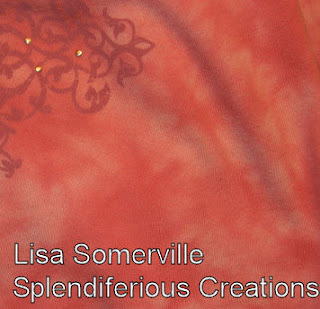 great inspiration Lisa - love this technique, but I never seem to have luck with it. Maybe I need to try again! Love the fall card!! thats an awesome card! I will have to try this soon...I learned almost the same tech. 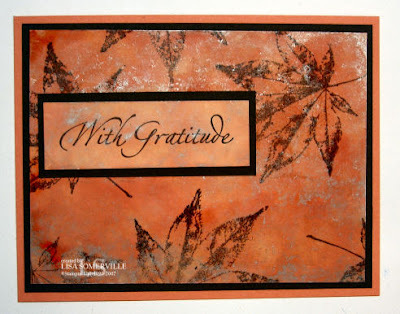 in a stampin up class a while back its so much fun to do and it looks awesome! We just didnt add the metallic color. What a beautiful, elegant card! Haven't done Polished Stone in a long, long while....love how it matches your shirt. Awsome tutorial! Thanks for the refresher!